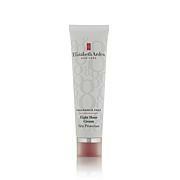 Uplift your senses with the refreshing fragrance of green tea and nectarines. Inspired against a backdrop of fleeting sunlight, animated laughter and clinking glasses, this fruity floral body cream is the perfect way to emanate sunny days. 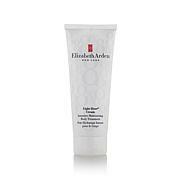 Surround yourself in the memory of eternal summer with Elizabeth Arden. Ingredients: WATER/AQUA/EAU, CETEARYL ALCOHOL, MINERAL OIL/PARAFFINUM LIQUIDUM/HUILE MINERALE, PARFUM/FRAGRANCE, GLYCERIN, GLYCERYL STEARATE, CAPRYLIC/CAPRIC TRIGLYCERIDE, CETYL ACETATE, THEOBROMA CACAO (COCOA) SEED BUTTER, C12-15 ALKYL BENZOATE, DIMETHICONE, ACETYLATED LANOLIN ALCOHOL, ALCOHOL, ALOE BARBADENSIS LEAF JUICE, ANTHEMIS NOBILIS FLOWER EXTRACT, BUTYLENE GLYCOL, BUTYROSPERMUM PARKII (SHEA) BUTTER, CALENDULA OFFICINALIS FLOWER EXTRACT, CAMELLIA SINENSIS LEAF EXTRACT, CARBOMER, CETEARETH-20, CHONDRUS CRISPUS EXTRACT, CYCLOPENTASILOXANE, ETHOXYDIGLYCOL, GINKGO BILOBA LEAF EXTRACT, HONEY/MEL/MIEL, LACTOSE, MICROCRYSTALLINE CELLULOSE, PEG/PPG-18/18 DIMETHICONE, PROPYLENE GLYCOL, PRUNUS PERSICA NECTARINA FRUIT EXTRACT, TOCOPHERYL ACETATE, TRICETEARETH-4 PHOSPHATE, TRIETHANOLAMINE, TRITICUM VULGARE (WHEAT) GERM OIL, WHEAT GERM GLYCERIDES, BHT, BUTYLPHENYL METHYLPROPIONAL, CITRAL, CITRONELLOL, GERANIOL, HEXYL CINNAMAL, LIMONENE, LINALOOL, CHLORPHENESIN, METHYLPARABEN, PHENOXYETHANOL, PROPYLPARABEN, SODIUM BENZOATE, IRON OXIDES, YELLOW (CI 77492). 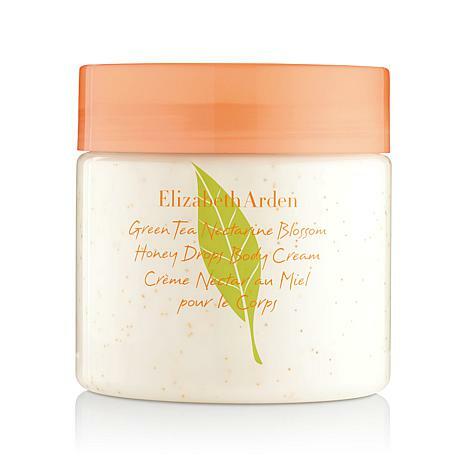 I can't get enough of Elizabeth Arden's Green Tea body creams. Each one smells slightly different than the other, but still have that clean, fresh, citrus scent. I love the little micro beads in it.